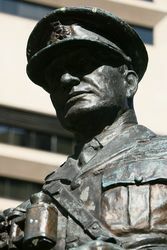 A statue commemorates Major General Sir Thomas William Glasgow who was a soldier and politician. 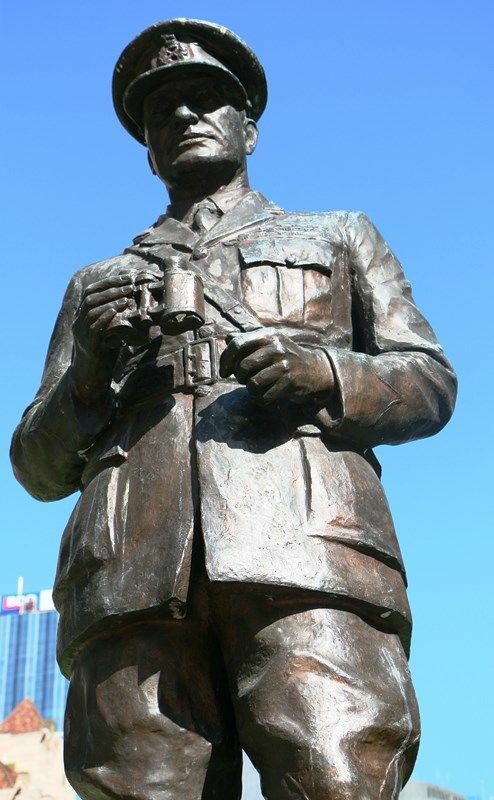 Sir Thomas William Glasgow (1876-1955) was an effective and widely regarded Australian divisional commander during World War One. Glasgow earned distinction when leading the Australian assault on Dead Man's Ridge at Gallipoli , of which he was one of only 46 to emerge unwounded (out of 200). In March 1916 he was appointed commander of 13th Infantry Brigade, which saw service at Mouquet Farm, Messines and Polygon Wood among others. Glasgow's post-war career was similarly extensive. He served as a Nationalist in the Australian Senate from 1919, accepting appointments as Minister for Home and Territories in 1926 and as Minister of Defence between 1927-29. In 1939 Glasgow was appointed Australia's first High Commissioner to Canada. Upon his death in Brisbane on 4 July 1955 at the age of 79 he was afforded a state funeral. K.C.B., C.M.G., D.S.O., V.D., C de G.
Of strong though not heavy build and of energetic demeanor Glasgow succeeded not so much by exceptional mental gifts or by tactical skill of any high order as by his personal driving force and determination which impressed themselves on all his subordinates. He always got where he wanted to get was consistently loyal to the Australian ideal and intensely proud of the Australian soldier. Sir John Monash, Commander in Chief, AIF. 1918. MAJOR-GENERAL THE HONOURABLE SIR WILLIAM GLASGOW K.C.B., C.M.G., D.S.O., V.D., C de G.